Too often, we indulge ourselves in the luxurious daydream of far-away destinations and exotic locales and in the intoxicatingly dreamy haze can lose sight of the beauty and adventure in our own backyards. This year, author and adventurer Alastair Humphreys is challenging the world to reevaluate daily routine and embrace microadventure. Here’s six ways to take advantage of home and make living local the new exotic destination. Adventures don’t always have to consist of long voyages to unfamiliar countries; in fact, most don’t. Adventure is what you make of it. Be imaginative. 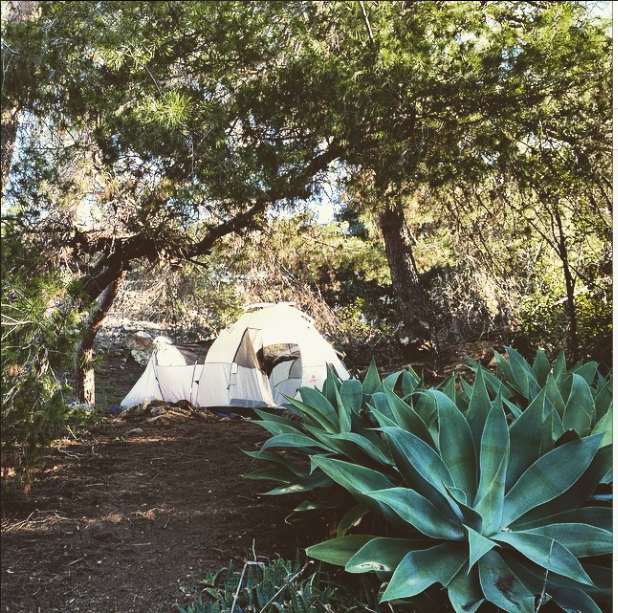 If that cruise to Mexico just doesn’t fit the budget, grab some tents and turn a backyard into a weekend nature retreat instead. Remember that movie, Yes Man? We’ve all had that dream of heading to the airport and buying the next ticket to anywhere, and while acting on a whim doesn’t have to involve flying thousands of miles, that ideology travels far. That racing heartbeat, flushed feeling that adventure gives you is all about the sense of the unknown, the unplanned. Little moments of spontanaeity can emulate the same high you get when stepping off a plane into a foreign country. Grab a friend and a map and drive up the coast, take a new route home from work or book a weekend getaway on impulse. You don’t have to go far, just go. 3. Opt for a new mode of transport. One of the best parts of traveling locally is not always needing to include the airport in your agenda. There are so many transportation options– plane, train, bus, car, bike, boat– you can get creative and turn the journey into part of the adventure. 4. Remember friends and family. 5. Learn more (about yourself). Microadventures are all about embracing new challenges and experiences in your own backyard. That means straying away from the comforts of daily ritual and viewing your surroundings with fresh eyes. Spend a day in a local museum. Try a new sport. Talk to new people. Attend a concert alone. Taste new food. Step outside of your comfort zone and learn more about the world around you. You might surprise yourself. When work, family obligations, and a never-ending to-do list seem to take up your entire week, all you want to do is spend the weekend in bed drowning yourself in Netflix and Buzzfeed quizzes. Don’t! Even if you only have one day off a week, take advantage of that day. Playtime is serious business. Seize every free moment; Netflix can wait. Life cannot. “Adventure is about doing something you’ve never done, doing it with enthusiasm and curiosity. Doing something difficult with passion.” -Alastair Humphreys.